Brady played the entire 1st half, and he might not play much next week, so Thursday’s game was probably our best opportunity to get a peek into what the Pats offense will look like this season. The short story is that Brady threw a lot to Hogan, Edelman, and James White. White rushed for 31 yards on 4 carries and caught 6 passes for 61 yards and a touchdown. Michel and Burkhead are both hurt, and going in the 6th round, while White goes in the 13th round. I’m starting to love White as an RB-5 in PPR. Michel is always hurt, and he’s going to wind up missing the most important month of the season for a rookie. Burkhead is hurt too, and he can’t seem to stay on the field. White only had 99 touches last year; because Dion Lewis played elite-level football and had 210 touches. Those are up for grabs this year, as are the 106 that Gillislee had, so I think it’s easy enough to pencil in White for 150 touches this year. That could look something like: 70 receptions and 925 total yards, and he’s certainly going to get you some touchdowns. Did you know that White had 4 touchdowns in the 3 Pats playoff games last year?!?! He’s a late round PPR steal with the way things have unfolded in that backfield. Chris Hogan had 7 targets, catching 5 for 25 yards and a touchdown. Many of us were reliably drafting Hogan in the 6th round, but that probably won’t happen much anymore. Everyone knows that Hogan was on pace to be a top 10 WR last year before he got hurt. A preseason TD from Brady, and being on every expert’s love list is all he needed to make a jump. He’s already being taken in the late 4th and early 5th round in competitive leagues. A word of caution on Hogan – he might not be able to handle a full season of work. It’s not like he was a rookie last year; Hogan has played 5 seasons, and has never had over 41 receptions in a single one. I loved his value in the 6th, but his risk would be appropriately factored into a late 4th, early 5th round grade. So I don’t mind him there, but you’re paying retail. Edelman caught 4 short passes for 26 yards. It was good to see him back on the field, and he’ll be a starter once he returns to a lineup that is thin on receivers. His ADP has come down a touch since Hogan’s has been on the rise. And he makes sense in his new range. He’s going to catch a lot of passes once he returns. I don’t think he has the agility to make big things happen in the YAC category anymore, but the Pats need him to move the chains. No teams have a bye week for the first 3 weeks of the season, and only the Panthers and Redskins have byes in week 4. You’re only drafting Edelman as a backup WR anyhow, so you can easily get away with stashing him for 4 weeks. And I think you’ll get some value from him down the stretch. Rob Kelley started the game and was featured early, but didn’t do much. He had 17 yards on 7 carries, and surprisingly saw 2 targets in the passing game, catching one for a 13 yard gain. Kelley is only 25 years old, and is going to get some looks early in the season, but it’s hard to forget his nightmare 2017 campaign, in which he averaged a putrid 3.1 yards per carry. Samaje Perine came in on the 2nd series and jumped 2 rounds in ADP, and then lost 3 rounds in ADP all within a 10 second span. This occurred when he exploded for 30 yards on his only carry, and then promptly came out of the game with an ankle injury. The burst has been there for Perine in two straight weeks, and he has what is considered a minor injury. But Perine played behind Kelley on Thursday, and he’ll be out for the rest of the preseason, which should rule out any possibility of him being some surprise, early season breakout candidate. More interestingly, Kapri Bibbs came in during the 2nd quarter and had 47 yards on 7 receptions. I think that just goes to show that the Redskins feel comfortable throwing it to the “Chris Thompson” role a lot. Once he’s healthy, Thompson is going to catch a lot of balls this year. Whether he can handle the volume or not remains to be seen. Oh, and I still think Perine is worth stashing if you can get him late; he’ll find his way to relevancy at some point. Jordan Reed missed the game due to illness. It was mentioned that he caught some type of virus. Alex Smith threw one pass to Vernon Davis, a 16 yard completion. 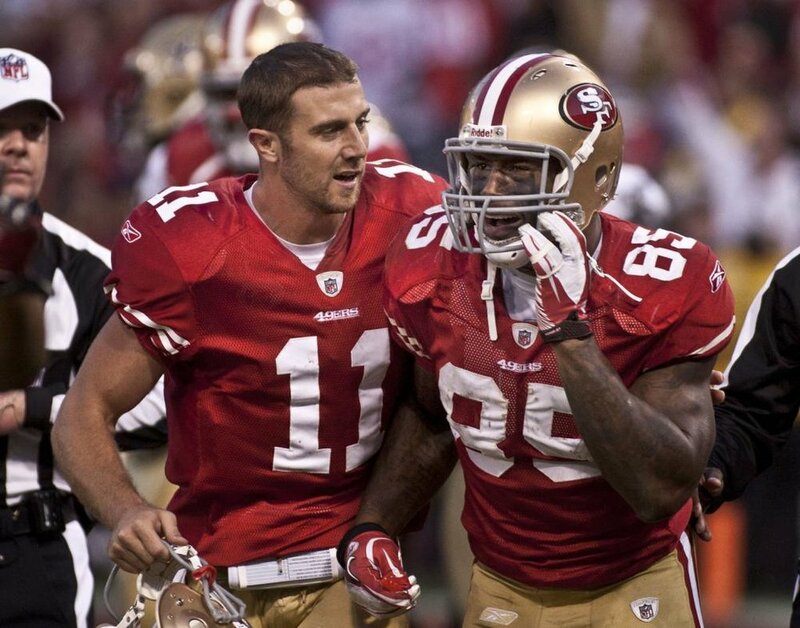 Remember that Vernon Davis had his best seasons playing with Alex Smith in San Francisco. Reed obviously has a lot more agility than Vernon Davis does at this stage of his career, but Davis is still capable enough to be on the field. It makes sense for the Redskins to use both, as keeping Reed’s workload down might be the best way to keep him from getting hurt. Between his injury proneness and the chance of Vernon Davis taking away some opportunities with his old teammate at the helm, I’d rather go elsewhere with the position in drafts. Aaron Rodgers looked solid in one quick drive where he hit Adams for a big one, and Graham for an 8 yard TD. That was it for Graham and Adams. Cobb was on the field for that drive but he and Rodgers couldn’t connect on his lone target. Allison only had one target with the backups, but it was also incomplete. Adams has a big play in both preseason games, and is so far ahead of the other WR’s on this team, that I think he’ll be a dependable WR-1 even if Graham hogs the end zone targets. We don’t have any good reason to think that Cobb or Allison is likely to outperform their ADP, even though their ADP seemed low two weeks ago. Just as things were looking up for Jamaal Williams, he hurt his ankle on Thursday night. The injury is considered minor, but he will likely miss the rest of the preseason. It’s fair to ask; can Williams or Aaron Jones stay healthy? They’re both hurt right now, and they were both hurt throughout chunks of the season last year. Then there’s Ty Montgomery, who came in and rushed for 10 yards on 4 carries, adding 13 yards on two receptions. He was off to a good start early last year before injuries caught up with him, and he’ll see plenty of third downs this year. It might seem drastic to lose hope on Williams after one minor injury, but there’s more to it than that. He’s competing with one RB who runs between the tackles better, and another RB who is a better receiver out of the backfield. He can’t have any hiccups if he’s to hold onto a thick workload. I think it makes sense to avoid this backfield for the most part. These three are always hurt, none of them are that special, and they’ll likely be in some type of committee. That said, I would draft any of the three if they fell a couple of rounds past their ADP. 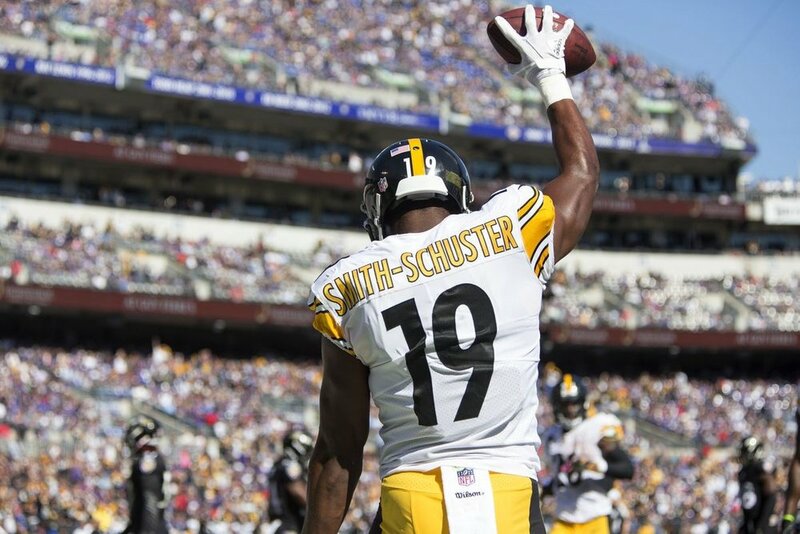 Another week, another one catch, touchdown performance for JuJu Smith-Schuster, though this one was only for 4 yards. Good luck keeping him out of the end zone while teams deal with Bell and Brown. The only bad news for Juju, is that the Steelers might have another big time threat to throw to in James Washington. Washington played with the 2nd unit against backups, so his 114 yard, 2 touchdown performance wasn’t the headline of the day. But he was obviously the best player on the field, and the backups had no chance against him. Washington should have never been the 7th Wide Receiver taken in the draft, and the Steelers appear to have struck gold with him. If an injury were to happen to either of the Steelers starting two WR’s, Washington could be this year’s JuJu. Otherwise, I think he’s on the radar for Best Ball and Dynasty Leagues. This all bodes well for Big Ben to put up gaudy numbers this year…at home. Final note on the Steelers: James Conner is good, and always passes the eye test (5 carries for 57 yards and a touchdown on Friday). If he’s on waivers and Bell was to get injured, Conner would go for max waiver dollars. I’m not big on handcuffing, but he’s a deep roster lottery ticket whether you have Bell or not. Tevin Coleman and Calvin Ridley both looked good, and stood out in the box score. But let’s keep in mind that Julio Jones and Devonta Freeman had the night off. Ridley and Coleman are both talented, and the Falcons offense is looking good again, but they would most likely need an injury in front of them to provide value for their ADP. Kareem Hunt caught a designed 2 yard TD pass from Mahomes, but it was called back because of a hold. He also had a big gain on a reception earlier in that drive, and I’m taking the over on 50 receptions this season. There has been some “expert” buzz on Hunt being a fade in the entire first round. The support being that Spencer Ware is a similar athlete, and that Hunt mostly fell apart after a scorching hot start last season. Well, Spencer Ware still hasn’t been on the field through two preseason games now, and might not even be the #2 RB on this team for weeks or even months. I wouldn’t factor him into the equation much. And while Hunt certainly did hit a rookie wall mid-season last year, he finished very strong with 6 td’s in his final 5 games, including the playoff loss to Tennessee. You can draft Hunt with confidence in the middle to late 1st round. The play of the game was a 69 yard TD bomb from Patrick Mahomes to Tyreek Hill, where both players were able to show off their gifts. Mahomes didn’t look great early on, but when you can throw a perfect 65 yard bomb down the field, it makes up for a lot. He had been slipping in ADP thanks to a training camp full of interceptions, but this highlight was seen by many, and he should jump back in front of Goff and Matt Ryan. Mahomes isn’t the worst bet to lead the league in interceptions, but he’s going to have some monster weeks. 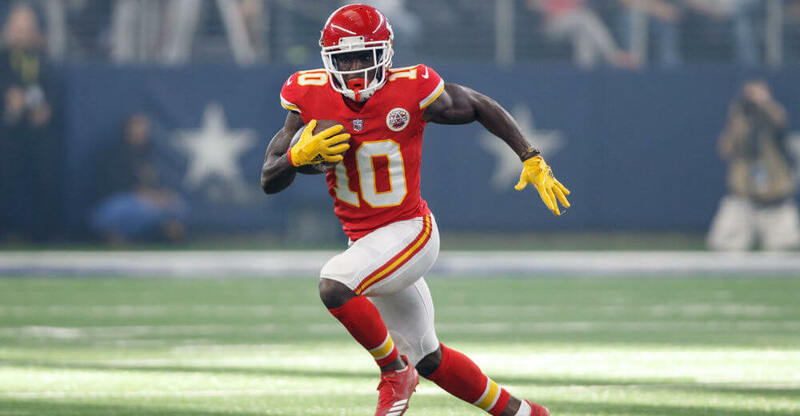 As far as Tyreek Hill is concerned, if you were worried about his production after the Watkins signing…don’t be. Outrunning everyone deep on a handful of plays this season is a given for Hill, but he has quietly become a good receiver on short routes, creating separation at will. You’ll see that Hill was routinely catching 6 and 7 balls per game towards the end of the season and in the playoff game. Some write him off in PPR as “fluky big play guy,” but he’s no fluke. Sammy Watkins had a rough go of it on Friday night, and didn’t catch a pass despite being targeted 3 times. Kelce, Hunt, and Hill will all get theirs. So for Watkins to have a big season, it would require elite production from Pat Mahomes. I suppose that is one possible path this season, but it’s more likely that Mahomes merely puts up decent production, with Watkins being the odd man out in terms of being a fantasy starter. It was a miserable day for the Lions 1st string offense, as the Giants defensive line took over the game. Abdulla started the game for some reason, and had just 7 yards on 2 carries. Kerryon Johnson did see first quarter work, but could only rack up 9 yards on 4 carries. Meanwhile, Theo Riddick was in early on 2nd and long, and took a reception for 42 yards, setting up a Lions field goal that was their only points of the first 3 quarters. Riddick ended up with 3 receptions and 56 total yards. Blount didn’t get work until the mid-2nd quarter, which is interesting since he started last week, but the Lions already know what they have with him. He had 32 yards on 11 carries. I want no part of this backfield. It’s too crowded; and they have specialists who will get plenty of work. It’s comical that Abdulla has received carries before Kerryon Johnson in both games, but the real concern is with Blount and Riddick eating just enough of a pie that wasn’t all that tasty to begin with. AJ McCarron played poorly through the first quarter before breaking his collarbone. Josh Allen came in and led the Bills on 3 straight scoring drives in in the 2nd quarter. At this point, the only reason the Bills might start Nate (5 interceptions in one half) Peterman for the first few games, is to save Allen from the beating he’s sure to take against a tough opening slate of games, behind a line that looks lost in pass protection. Having said that, Allen now has 49 yards rushing and 2 passing touchdowns in exactly 3 quarters worth of work. He’s been elusive in the pocket, and he throws gas. He’s also sure to be among the league’s worst in completion % this season, but we shouldn’t just ignore rookie QB’s with big arms, who make things happen with their legs. If you’re in a Dynasty or Super Flex League, you need to be aware of Allen. Finally, we have a little clarity on an important battle for touches. It was Carlos Hyde early, as he ripped some chunk gains on his way to 64 yards and a touchdown on 9 carries. Yes on the eye test! Duke Johnson was sprinkled in from the first series, and had 27 yards on only 4 carries. He wasn’t used in the passing game, but we know that’s an outlier. Nick Chubb didn’t get in the game until late in the 2nd quarter, and managed 53 yards and a touchdown on 11 carries against backups. Chubb also caught 2 passes but couldn’t do anything with them. Hyde has been a productive player, and he’s going to have every opportunity early in the season. He’s not the most efficient player, but neither was Crowell, who was always able to compile production in Cleveland. Chubb isn’t close to jumping Hyde on the depth chart. I’m off Chubb for now. I just don’t feel like spending a 9th round pick on a guy who will do nothing for the first half season. And I think Hyde is going to give you decent value in the 8th round, as a viable backup RB through most of the bye weeks. They may both be worthless by the fantasy playoffs, when Chubb would start to get more carries on a team that will be out of any playoff picture. Duke Johnson was a PPR RB2 last year thanks to 74 receptions and a surprising 7 touchdowns. He’s a talented receiver, and he’s a shifty runner, so being in eternal garbage time helped his cause last season. But this year the Browns have two shiny new toys at RB, and they can’t be as bad a team as they were last year. So barring an injury in the backfield, Duke won’t repeat his #’s from last year, and is just a decent PPR backup that you’ll never feel great about starting. Christian McCaffrey put on a show, bursting between the tackles for a 71 yard touchdown. He looked fine on a few more carries, bringing his rushing total to 92, and he caught 4 passes for 28 yards. Wherever you envisioned yourself drafting McCaffrey in upcoming leagues is nothing more than a dream now. In PPR, expect him to be taken before Adams, Thomas, Julio, and maybe even Cook. And in standard, we may see him jump the likes of Jordan Howard and Devonta Freeman. It’s hard to argue against McCaffrey at this point. His early season struggle with interior runs last year is about the only knock on him. I suppose there are workload concerns due to his size, but we have no reason to think he won’t be in the Alvin Kamara-workload territory. Running backs tend to get better in their 2nd year, and the stage is really set for a big time season here. I still think CJ Anderson is capable enough to be on the field, and so I’m not going to take McCaffrey in the early to mid-2nd round of Standard leagues. But in PPR, we’d be lucky to get him anywhere in the 2nd round. Drake is a popular fade this season among experts. He finished last season as hot as any RB, and had a knack for big plays. But doubters point to competition for touches, a bad o-line, playing for a bad team with negative game scripts, and a fluky amount of big plays that padded his stats. I can’t argue about the offensive line. And it is a bad team, but I think those game scripts favor him as the likely 3rd down back. I don’t consider Frank Gore much competition; any touches Gore gets, any below average plodder would get just the same. Ballage is hurt and in the dog house. And while I do think Drake relies on big plays to get his #’s, I just think he’s good at ripping chunk gains. He ripped another one Friday night, a 34 yard run. He ended his night with 54 yards on 8 carries, and he chipped in 3 receptions for a measly 4 yards. I don’t think this offense is going to be the worst in the league as some do. Tannehill will be better than Cutler was. Drake is currently the 22rd running back in ADP, and I think he gives you a little bit of everything for that price. He flashed his big potential at the end of last year. He catches plenty of passes. He had 4 TD’s in the final 8 games last year, which isn’t the worst pace. I think his floor is being an upside flex play. And I think he showed us his celling last year; he can be a back end Rb-1 if things break right. I don’t even think he’s a great value late in the 4th round, which is where he usually goes. I just think the price is right for him there if you need a running back. Arizona’s offense showed some potential on Friday. Bradford hit Fitzgerald, Christian Kirk, and David Johnson with passes early. Josh Rosen came in early enough and looked sharp, connecting with Kirk for a touchdown. David Johnson reminded people that last year’s injury was to his wrist, not his legs, as he took a few Saints defenders for a ride on the way into the end zone. The Cardinals probably have two decent Quarterbacks on the roster, and they’ll both throw plenty of passes to Fitzgerald and David Johnson. The question is whether the rookie and 2nd round pick, Kirk, can become relevant. He was listed behind a slew of other receivers on the depth chart just a week ago, and doesn’t have great size. But he has good hands and speed, and he runs crisp short routes. A Cooper Kupp-like rookie season is a possibility, making him a stash in deeper leagues and in Dynasty. Cousins struggled in the game, completing just 3 of 8 passes for 12 yards. And it seems like people are either overreacting or underreacting to it. If you think this is a sign of bad things to come for the offense, calm down. It’s not fun to play against the Jaguars 1st string Defense. It was a couple of shaky drives, not something to make a big a deal of. This team is still loaded with talent. However, I wouldn’t just pretend it didn’t happen either. Cousins is still getting used to the offense and figuring out his timing with the receivers. It is certainly possible that he has a slower first month of the season, and that it takes him a few games to get into a groove with his new team. In every 10 drafts or so that I review, I see someone take him freakishly early, ahead of Watson and Wentz. Cousins is good, but he’s not good enough to reach for like that. There really was nothing to see here, but that is actually the take away from this game. Dak was in for a few long drives, and sprinkled a handful of targets to everyone. Gallup had 2 receptions for 16 yards, but he and Dak couldn’t connect on a couple of others. Hurns was back on the field, and caught 2 passes for 13 yards, though Dak tried to get him in the end zone on an incompletion. Cole Beasley took the night off due to a minor groin injury. Of course Dak did throw a touchdown to none other than…Terrance Williams, because why make things easy. We may not have a consistent fantasy producer in this group, but now that Hurns is back, he’s the one worth rolling the dice on late. We’ll know what he is early enough in the season, and he might be OK. Gallup will have an opportunity to come on later in the season; he still looks a little too raw to be consistent early in the year. I came close to writing about Goodwin last week, but I stopped myself from gushing over his lone reception, an 18 yarder. He just looked so crisp on that route, and picked up 5 extra yards that most other receivers would have left on the table. But this week, featuring him in the article was a no-brainer. Goodwin was targeted 3 times by Jimmy G., with all 3 going for completions and totaling 61 yards. The scary thing about his 4 preseason targets is that there was nothing a defender could do to stop any of them. That’s how locked in Jimmy G. and Goodwin are right now. There’s a real chemistry building with these two, and it started last season, when Goodwin had a big second half. I think Goodwin is going to be heavily targeted this year, so he should be consistent, while still offering the big plays. I’ll remind you that Goodwin ran a 4.27 40 yard dash. I think we saw the cold, hard truth for the Buccaneers In what turned out to be one of the more entertaining games of the weekend. Ryan Ftizpatrick is going to be rough. The Bucs can’t cover anyone, and are going to get lit up by good passing offenses. And there is still hope for this offense once Winston returns. Fitzpatrick has had intermittent success in this league, but this team is a bad fit for him. He doesn’t have the arm to make use of an incredibly athletic and diverse group of pass catchers, and he is not who you want back there when you’re constantly playing from behind thanks to a leaky secondary. Fitzpatrick completed only 5 of 13 passes playing the entire first quarter on Saturday. The whole offense is a fantasy miss for the Fitzpatrick weeks, as they play the Saints, Eagles, and Steelers. The Bucs did the right thing by leaving their starting receivers on the field for most of the 2nd quarter, letting Winston get reps with them. Winston got hot, completing 13 of 18, for 226 yards and 2 touchdowns. The narrative on Winston’s season last year is a bit off. It wasn’t nearly the disaster most are making it out to be, certainly not in fantasy. He was on pace for 4,321 passing yards and 24.6 total touchdowns. Those are serviceable, high end #2 or very low end #1 QB #’s, and that was in a year where Winston clearly could have played better. With the receivers on this team on the verge of a group-breakout, I’m buying Winston as a top 10 QB when he returns. He could be the perfect answer to teams who have early season QB problems. As for: Evans, Godwin, Desean Jackson, Humphries, Howard, and Brate: they all look great, and I don’t want any of them in fantasy. Some of them are tempting, but it’s just too talented of a group, and the targets will get spread around. Mike Evans is certainly not going to get the volume he needs to justify his ADP. Peyton Barber got the start and looked good, rushing for 32 yards on 6 carries. Ronald Jones struggled again, and he just looks lost at this point. The Bucs don’t block well; there aren’t going to be a lot of big holes to run through. It looks like Jones is going to need a half a season to adjust to the speed of the game, and figure out how to make things happen without the luxury of good blocking. Peyton Barber is in the right place at the right time. Even with the bad line, Winston might be able to open things up in the passing game enough to help the running backs a bit. I think Peyton Barber is a very good value right now; and someone without a clue in your league will draft Ronald Jones 3 rounds too early. Taylor has been a late round flier for those paying attention to things. And after a 4 catch, 95 yard, 2 touchdown performance on Saturday, even those barely paying attention will remember his name if he's available late enough in the draft. Taylor caught a touchdown from Mariota, and one from Gabbert. With Matthews still hurt, the Titans might end up featuring youth and upside in their starting lineup with Taylor and Corey Davis, who played but didn’t catch a pass in the game. This game solidifies Taylor as a late round, roster stash, but he’s still nothing more than an upside WR-5. Burton is getting a lot of buzz after catching 4 passes for 45 yards and a touchdown on Saturday. I suppose it’s more the eye test than anything else. Trubisky was at his best targeting Burton in the middle of the field; and they did show some good chemistry. Matt Nagy worked with Kelce in Kansas City, and is now coaching the Bears. Burton isn’t as big as Kelce, but he will likely be used similarly. Burton is the guy you want if you don’t get one of the top 3 tight ends. It’s fitting that both J. Brown’s from Arizona are on different teams now, after driving fantasy players crazy in the box scores for a couple of years. We’ve been hearing more about John Brown in Baltimore than about Jaron Brown, now in Seattle. But with Tyler Lockett out for the 2nd preseason game, Brown got the start and looked physically imposing, catching both of his targets from Wilson for big gainers, and a combined 74 yards. Lockett and Brown have always just been a fantasy tease, but one of these two has a good chance to be fantasy relevant this season. We thought Lockett had the inside track, and perhaps he still does. But if he doesn’t play well or he’s not consistent for that offense, I would expect Jaron Brown to get plenty of looks. We should see both of them on the field in three-wide sets, so it’s also possible that they both chip in a relatively useless 700/5 each this season. Either way, Jaron Brown has entered the very late-round, quality dart throw conversation.